How safe are our playgrounds from extreme weather conditions? In summer time and our kids love to play in our playgrounds. We understand their excitement and we tend to undermine their safety. Cali Shades Sails provide playground shades for our children in our playgrounds. We are the best among the best in the country today because we have a team of experts who can provide immediately the needs of our playgrounds. In Fontana, CA, for example, Cali Shade Sails is in the fore front providing safe guards of our children playing under the sun. We have provided them the necessary shading cover when they want to play or rest from playing. We also provided shading cover for their moms in the sidelines just looking at them. Cali Shade Sails also provided shades for their cars in the parking lots. Our shading cover comes in different colors, designs and materials used. We want our clients to have the free hand to choose. Our playground shade sail covers are heavy duty and last a very long time. Although we specialize mainly in commercial playground shade sails we can do residential well. ​In San Bernardino, CA, for instance, Cali Shade Sails has received city requests from mothers who need to look after their children enjoying their vacation in the city’s playground. Cali Shade Sails services allows our customers to customize their orders according to their specifications such that the safety of their families were being considered first before anything else. That is why we have maintained our integrity and untarnished reputation with our clients for years. Playground covers come in different sizes according to the desired dimensions of our commercial shade sail clients and the size of the playground that need to be covered. Playground shade covers are limited in sizes but we will adjust to suit the need of our clients. 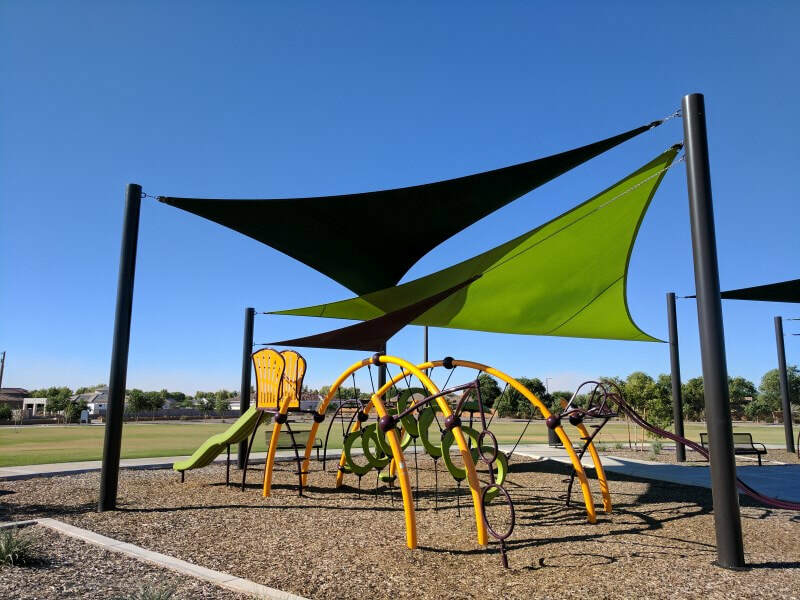 Cali Shade Sails has been open for orders of playground shade covers in Pomona, CA we are providing the residents of the city free inspection and cost assessment of your desired cover for the full protection of your family. Our Cali Shade Sail covers in providing the required shading of your playground on your desires and for the delight of your family. We offer a free consultation and inspection for cost estimation if you will contact us now.